Pundits in Israel are still struggling to make sense of Defense Minister Ehud Barak’s surprise announcement yesterday that, at age 70, he is retiring from politics. The move, like Barak’s January 2011 decision to leave Labor and start his own political party, caught everyone off guard. It also shattered the emerging perception that, following Operation Pillar of Defense in Gaza, Barak stood a decent chance of remaining defense minister in Benjamin Netanyahu’s next government. It’s not that Barak’s exit will have a big impact on Israel’s January 22 elections: Polls showed his Independence Party in danger of missing the two-percent threshold needed to win Knesset seats. But his departure from the defense ministry will have far-reaching implications for Israeli policy. That’s because the man most likely to replace Barak, Strategic Affairs Minister and Vice Prime Minister Moshe “Bogie” Ya'alon, disagrees with him on two of Israel’s most contentious issues: Iran’s nuclear program and West Bank settlements. On the surface, Barak and Ya’alon have much in common--both reserved former IDF chiefs of staff from left-wing backgrounds--but as members of Netanyahu’s eight-man inner security cabinet, they have feuded vehemently (and, at times, publicly). For a few years now, Barak has argued that Israel needs to strike Iran’s nuclear facilities--against American wishes, if need be--before the country reaches the “zone of immunity,” a term he coined to denote the point at which Israel will no longer be able to set back the program militarily. Publicly, Ya’alon has seconded that view. “[I]f the question is bomb or bombing, the answer is clear: bomb[ing],” he told Ha'aretz's Ari Shavit in a wide-ranging June interview. In August, he went further, accusing the U.S. of sending mixed messages to Tehran regarding the prospect of military action. One minister who belongs to the octet said that, at the forum's meetings, Ya'alon and Barak presented diametrically opposed views: Barak supported an Israeli military strike on Iran and said it should take place as soon as possible, while Ya'alon argued that Israel should give international sanctions on Iran more time, and that if military action did become necessary, it would be better for America to do it. Under no circumstances should Israel conduct such an operation on its own, Ya'alon said. It remains to be seen whether a Defense Minister Ya'alon would argue for giving sanctions more time come spring, when weather conditions again permit an Israeli strike and Iran approaches the uranium-enrichment “red line” drawn by Netanyahu at the UN in September. What is clear, however, is that he would bring a markedly different perspective on the Palestinian issue, particularly on the question of settlements. Barak has been the bete-noire of the settlers since his short-lived stint as prime minister from 1999 until 2001. More than any other Israeli leader, he broke taboos on territorial concessions by offering to divide Jerusalem and to establish a Palestinian state on all of Gaza and some 95 percent of the West Bank during the 2000-01 peace talks. 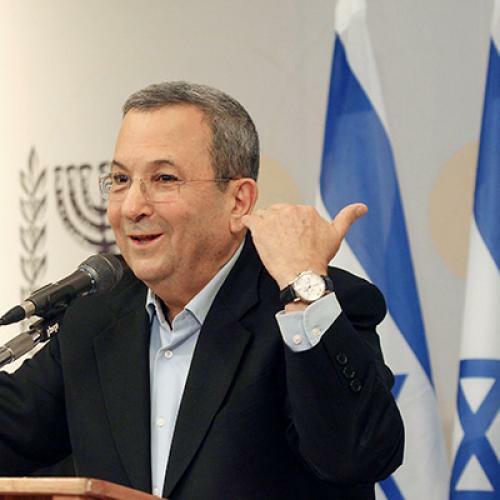 In his capacity as defense minister, Barak was attacked by the right for delaying approval of various West Bank construction projects and for pushing the evacuations of illegal outposts. Barak, unlike Ya'alon, supported Netanyahu's ten-month settlement freeze and was one of the leading voices urging the prime minister to heed President Obama's call for a two-month extension. Cheering Barak’s retirement, Minister of Diaspora Affairs Yuli Edelstein said Monday that “Barak will go down in the history of Israel's governments as the worst defense minister that the Jewish settlement enterprise ever had." Though Ya’alon supported the 1993 Oslo Accords, in recent years he has shifted right on the Palestinian issue. At a 2009 conference, he called the group Peace Now a “virus” and said—regarding U.S. pressure over settlements—that he was “not afraid of the Americans.” “From my perspective,” he was quoted as saying, “Jews can and need to live in all of the Land of Israel for all eternity." Shavit: And we can live like this for another 20 years? Ya’alon: We can live like this for another 100 years, too. The full Shavit interview is worth reading. Ya’alon says openly that whenever Netanyahu decides to retire, “I definitely see myself contesting the [Likud] leadership. The premiership, too.” If Ya’alon becomes defense minister, he will have the inside track on both.